I’m very happy to celebrate Georges Rousse’s 2006 transformative public art project in Durham with a 10th Anniversary screening of Bending Space: Georges Rousse and the Durham Project on Sunday, October 9th @ 8pm at the Carolina Theatre of Durham. Bending Space holds a special place in my filmmaking heart and in my ‘catalogue’ of artist docs. I like to say it’s aged like a fine wine. The film is a great snapshot of Downtown Durham just before the boom, a time when restaurants and bars were scarce and parking spaces plentiful. The film also captures an inspirational story about the power of public art and celebrates the creative process of visionary French photographer/installation artist Rousse. 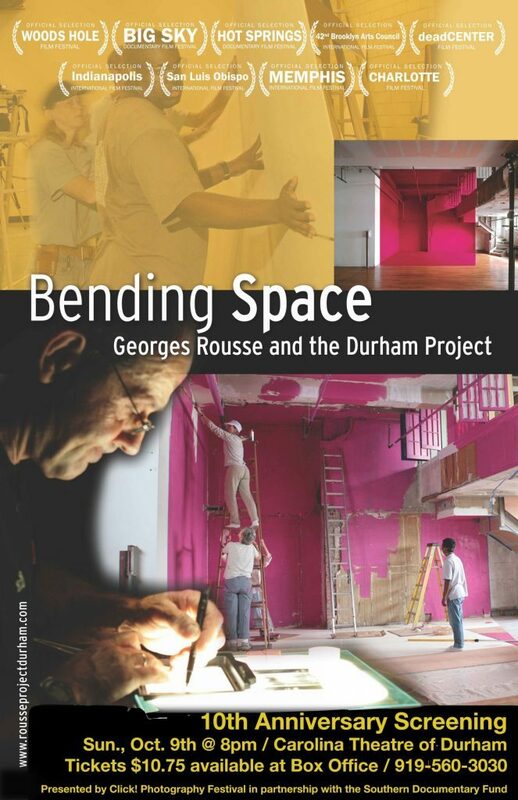 A decade after Penelope Maunsell and I documented Rousse’s project and produced Bending Space, much has changed in Durham. The film is a catalyst for dialogue about the relationships and tensions between the arts and development in a rapidly changing urban landscape. Tickets are $10.75 and available at the Carolina Theatre of Durham box office, 919.560.3030. This special screening is presented by the CLICK! Photography Festival in partnership with the Southern Documentary Fund.